Dymonic 100 is a high-performance, medium-modulus, low- VOC, UV stable, non-sag polyurethane sealant. Formulated with an innovative polymer technology similar to TREMproof 250GC and Vulkem 45SSL, Dymonic 100 is highly versatile and has a unique capability to adhere to damp or green concrete. Dymonic 100 is a durable, flexible, sealant that offers excellent performance in moving joints and exhibits tenacious adhesion once fully cured. Typical applications for Dymonic 100 include expansion and control joints, precast concrete panel joints, perimeter caulking (windows, door, panels), aluminum,masonry and vinyl siding. 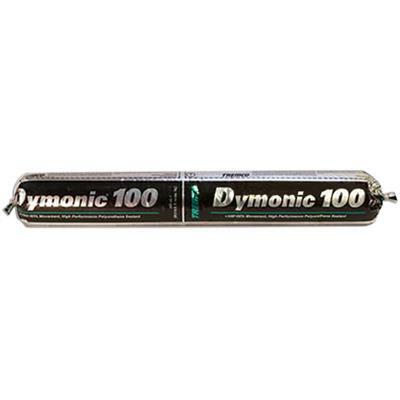 Dymonic 100 is suitable for water immersion and is approved to be used as fluid applied flashing. Dymonic 100 can adhere to damp or green concrete and has a skin time of 2 hr with a tack-free time of 6-8 hr to significantly reduce dirt pickup. It has a movement capability of +100/-50% in typical field conditions, is low-VOC, paintable, jet-fuelresistant, and will not crack, craze or yellow under extreme UV exposure. Dymonic 100 is compatible with Tremco’s line of Vulkem deck coatings, ExoAir air barrier products and the cold, fluid-applied TREMproof line of below-grade waterproofing products.